INSET: The “Painted Prince” and Tattooed Visayans. Let’s finally set the record straight. One of the longest running myths about tribal, non-Western tattooing is that it was “brought” to Europe and the West by sailors associated with Captain Cook’s voyages to Oceania. This is not true, of course, since there have been indigenous forms of tattooing practiced in Europe since the Neolithic (think Iceman) and onwards through time (Bosnian Catholics and Christian pilgrims to the Holy Land, etc.) prior to Cook’s return. Sadly, peer-reviewed ‘scholarly’ tomes continue to perpetuate these ‘facts’ and one of my favorite (mis)statements is this doozy: “The first ever tattoo was reported by Captain Cook” (Lemma 2010:184). Although it’s clear that Captain Cook certainly didn’t re-introduce tattooing to Europe, he and his officers popularized the discussion of it through their writings, which were widely read at the time. 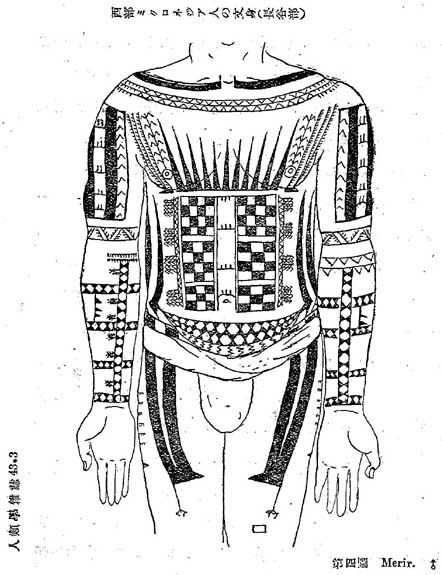 Another longstanding myth that continues to be perpetuated in the popular press, academic literature, and recent academic conferences I have attended is that of the Painted Prince Giolo (“Jeoly”), who several authors have posited was the “first recorded tattooed person to be exhibited in England” (Putzi 2006:14) or the “first” in Europe (DeMello 2000:47). Prince Giolo was purchased in India (via the Philippines) by William Dampier in 1691 and brought to England for display in a money-making venture. His home island was recorded as the Spice Island of “Meangis” (today’s Miangis Island), located less than one hundred miles approximately due east of the southern coast of Mindanao. Over the years, Jeoly has been described as a “Visayan” (Ellis 2008:189) and especially a “Marquesan” (Scutt and Gotch 1974:152), because his “pattern of tattooing is similar to designs recorded in the Marquesas in the nineteenth century” (Barnes 2006:39 citing Scutt and Gotch). But are these aforementioned facts legitimate or the stuff of legends? In 1566, a tattooed Canadian Inuit woman and her unmarked child were kidnapped by French sailors in Labrador and brought to Antwerp in The Netherlands. Here, they were put on display in 1567 for money at a local tavern and handbills survive documenting the sad event. This woman was the first tattooed Native North American drawn from life (Sturtevant 1980), a fact that busts another widely perpetuated tattoo myth. For example, many past and contemporary writers (too many to enumerate here) have wrongly identified John White as the creator of the “earliest” portraits of tattooed Native North Americans (1590), Algonquian-speaking peoples he encountered in coastal North Carolina in the late sixteenth century. Whilst I must confess that Antwerp is not in England (! ), Martin Frobisher captured two Inuit in 1577 and brought them to England for display. One of his captives was a tattooed woman from Baffin Island who was later illustrated by John White. Therefore, it seems that there were at least two Indigenous tattooed people exhibited in Europe prior to the Painted Prince’s arrival in 1691. Of course, anyone with knowledge of Micronesian and Marquesan tattooing practices and styles would tell you, as Tricia Allen (1991) did long ago, that Jeoly wore Micronesian tattoos that closely resembled those from the Caroline Islands. However, I would like to add that elements of Jeoly’s tattoos closely match those documented for men inhabiting the Palauan island of Merir (see Kotondo 1928) and other isles in the Sonsorol group, islands that lie approximately 400 nautical miles due east of Miangis. Oh, and speaking of the most widely perpetuated (and recent) tattoo history myth of all…As of 2013, archaeological evidence indicates that the earliest form of human tattooing does not appear on the mummified corpse of the 5,300-year-old European Iceman. Instead, the oldest evidence appears as a 7000-year-old indelible mustache on the upper lip of a male mummy of the prehistoric Chinchorro culture of Chile, South America (Allison 1996:127; Krutak 2007:243). So my friends, cosmetic tattoos have been around for a very long time, demonstrating that the human desire to adorn the skin is indeed a very ancient tradition. BUT WAIT A MINUTE… I think this myth – one that I have propagated inadvertently – is WRONG! Please follow this link for an update! Allen, T. 1991. “European Explorers and Marquesan Tattooing: The Wildest Island Style.” Pp. 86-101 in Tattootime: Art from the Heart (D.E. Hardy, ed.). Honolulu: Hardy Marks Publications. Barnes, G. 2006. “Curiosity, Wonder, and William Dampier’s Painted Prince.” Journal for Early Modern Cultural Studies 6(1):31-50. DeMello, M. 2000. Bodies of Inscription: A Cultural History of the Modern Tattoo Community. Durham: Duke University Press. Ellis, J. 2008. Tattooing the World: Pacific Designs in Print & Skin. New York: Columbia University Press. Kotondo, H. 1928. “The Tattooing of the Western Micronesians.” The Journal of the Anthropological Society of Tokyo XLIII (483-494):129-152. Lemma, A. 2010. Under the Skin: A Psychoanalytic Study of Body Modification. London: Routledge. Putzi, J. 2006. Identifying Marks: Race, Gender and the Marked Body in Nineteenth-Century America. Athens: University of Georgia Press. Scutt, R. and C. Gotch. 1974. Skin Deep: The Mystery of Tattooing. London: Peter Davies. Sturtevant, W.C. 1980. “The First Inuit Depiction by Europeans.” Études/Inuit/Studies 4(1-2):47-49.